In-memory compute accelerator; reducing app power consumption; sensing with protein nanowires. Engineers at Princeton University built a programmable chip that features an in-memory computing accelerator. Targeted at deep learning inferencing, the chip aims to reduce the bottleneck between memory and compute in traditional architectures. The team’s key to performing compute in memory was using capacitors rather than transistors. The capacitors were paired with conventional SRAM cells and computation of data was performed using charge-domain compute, which stores the output signal from bit cells as voltage on the capacitor. 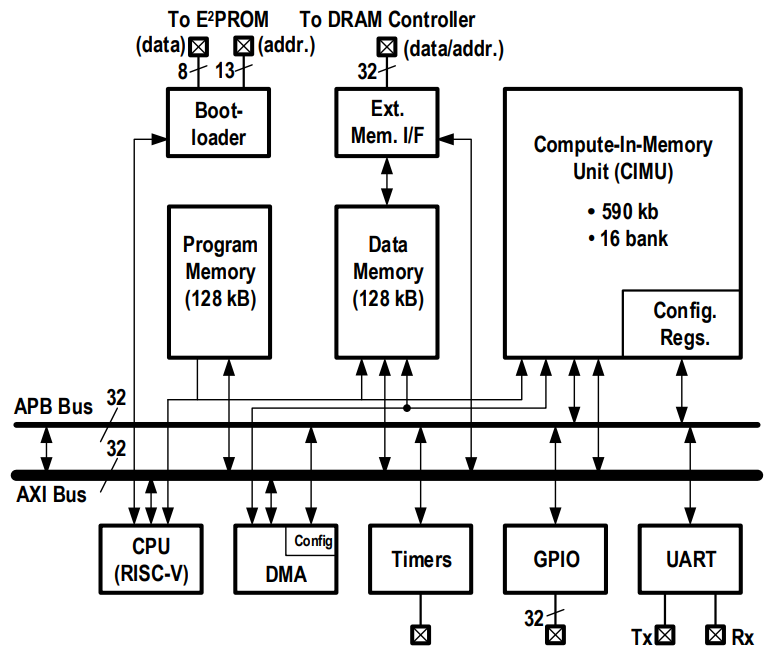 Implemented in 65nm CMOS, the entire chip comprises a 590kb Compute-In-Memory Unit (CIMU) integrated with near-memory interfaces, 128kB of standard program/data memory, 2-channel DMA, a RISC-V CPU, and peripherals for external-memory control, bootloading, host-PC interfacing (UART), general-purpose IO (GPIO), and scheduling (timer). The next challenge was programmability. The CIMU includes specialized interfaces for dataflow in addition to the in/near-memory compute. The chip works with common languages, including C, according to the researchers. The researchers note that for certain applications, the chip’s energy savings would be as critical as the performance boost. Chip measurements showed an energy efficiency of 152/297 1b-TOPS/W and throughput of 4.7/1.9 1b-TOPS (scaling linearly with the matrix/input-vector element precisions) at VDD of 1.2/0.85V. Researchers at Aston University propose a method to improve the battery life of mobile devices by identifying particularly power-hungry code then offloading it to be executed on the cloud. While the team’s mobile-cloud hybrid application framework incurs a data usage penalty in needing to offload, they think the power savings are worth it. “So far, we have carried out experiments on two diﬀerent Android apps. ImageEffects is a prototype and Instagram like app we created and Mather is an open source app available on Github,” said Aamir Akbar, a doctoral researcher at Aston who developed the framework. The general purpose framework, which works on Android, uses optimization algorithms to search for eﬃcient app conﬁgurations and could be applied to any app, according to the team. Next, the researchers are working to apply the technique to battery powered mobile robots for use in situations where battery life is critical, such as search and rescue operations. Scientists at the University of Massachusetts Amherst created a new class of ‘green’ electronic materials for biomedical and environmental sensing. By combining protein nanowires with a polymer, the team produced a flexible electronic composite material that retains the electrical conductivity and unique sensing capabilities of protein nanowires. Compared to silicon nanowires and carbon nanotubes, protein nanowires show good biocompatibility, stability, and potential to be modified to sense a wide range of biomolecules and chemicals. To work as a wearable sensor, however, the protein nanowires need to be incorporated into a flexible matrix. “We have been studying the biological function of protein nanowires for over a decade, but it is only now that we can see a path forward for their use in practical fabrication of electronic devices,” said Derek Lovley, a microbiologist at Amherst. The electrically conductive protein nanowires are a natural product of the microorganism Geobacter sulfurreducens, which uses them to make electrical connections with other microbes or minerals. In the proof-of-concept study, the protein nanowires formed an electrically conductive network when introduced into polymer polyvinyl alcohol. The material was treated with harsh conditions, such as heat, or extreme pH such as high acidity, but it continued to work well. One promising path is pH sensing, as the conductivity of the protein nanowires embedded in the polymer changed dramatically in response to pH. “This is an important biomedical parameter diagnostic of some serious medical conditions,” noted Lovely. The team has applied for a patent on the concept. Their next steps involve scaling up production and tailoring the nanowires to respond to other molecules.